The S9 VPAP S is the next generation model for the S8 VPAP S. This Bilevel machine provides one set pressure stream for inhale, and a lower one for exhale. S9 VPAP S is an improvement over the S8 VPAP S by including ResMed's Enhanced Easy-Breathe technology along with the Climate Control humidification system. Humidifier Included: Please note the price of this machine includes the heated humidifier. At its core this bilevel machine provides one set pressure for inhalation and a lower one for exhalation. 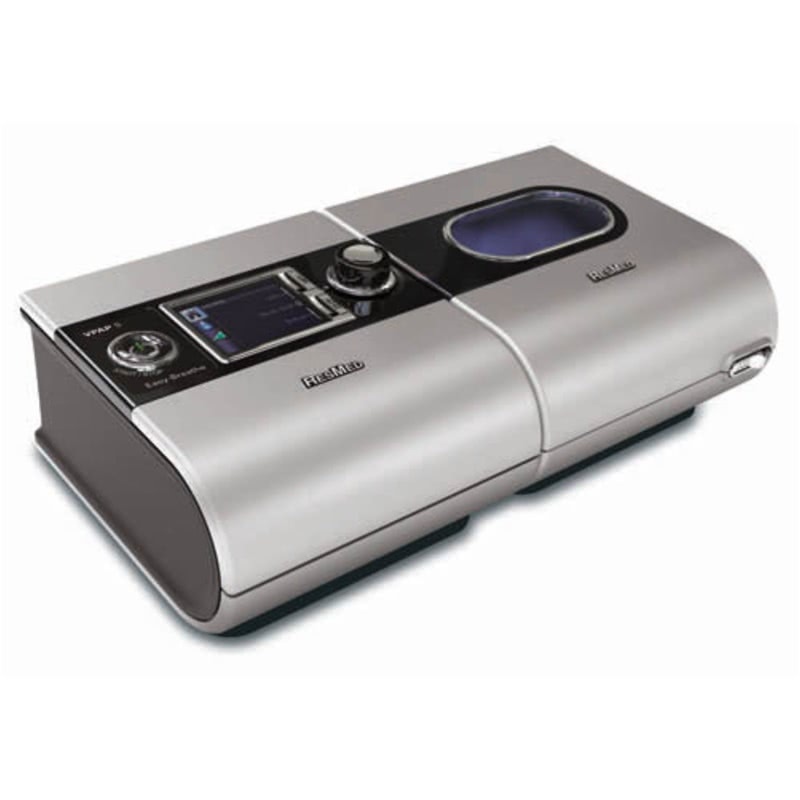 This model is an improvement over the previous generation S8 VPAP S by having improved comfort features that make it easier to breath against and adjust to pressure changes, quieter for the machine user and bed partner, and manage and maintain set temperature and humidity levels as room conditions change through the night. Enhanced Easy-Breathe Technology. This technology smooths out the transitions from inhalation to exhalation pressures making it easier to breath and adjust to the pressure changes. Climate Control Humidification System. With the use of the ClimateLine heated tubing, the Climate Control Humidification System maintains temperature and humidity levels despite changing environment conditions throughout the night. Quieter Motor. The S9 series of machines is an improvement over the S8 machines in the reduction of sound. The quieter motor transmits less sound down the tubing and through the mask for the CPAP user, and also is less audible to a bed partner. Digital Display & Push Dial. The S9 VPAP S has a digital display and easy to use push dial to set and change settings and review therapy data. SmartStart / SmartStop SmartStart / SmartStop enables your device to start automatically by breathing into the mask. This feature automatically starts and stops your CPAP machine when you put on or take off your mask. Enhanced Vsync Technology. This technology compensates for leak by monitoring and adjusting the baseline pressure as needed. TiControl Feature. This feature allows for more personalized settings in order to accommodate individual respiratory conditions by improving synchrony between the device and the user. Aircraft use: Device meets the FAA requirements for all phases of air travel. Required Settings: This machine requires two pressure settings and a Spontaneous rate. The S9 line of machines come with SlimLine hosing which has a 15mm diameter. A standard (22mm) hose can be used with the S9 machines, however the Patient Setup Menu must be accessed and the "Tube" setting changed from "Slim" to "Standard". If a ClimateLine hose is attached this setting is automatically changed accordingly. If an O2 Enrichment Adapter is used with the ClimateLine Heated Tubing for the S9 Series of CPAP machines, the O2 Enrichment Adapter must be placed between the ClimateLine tubing and the mask instead of between the S9 Humidifier and the hose, in order for the ClimateLine tubing to work correctly. 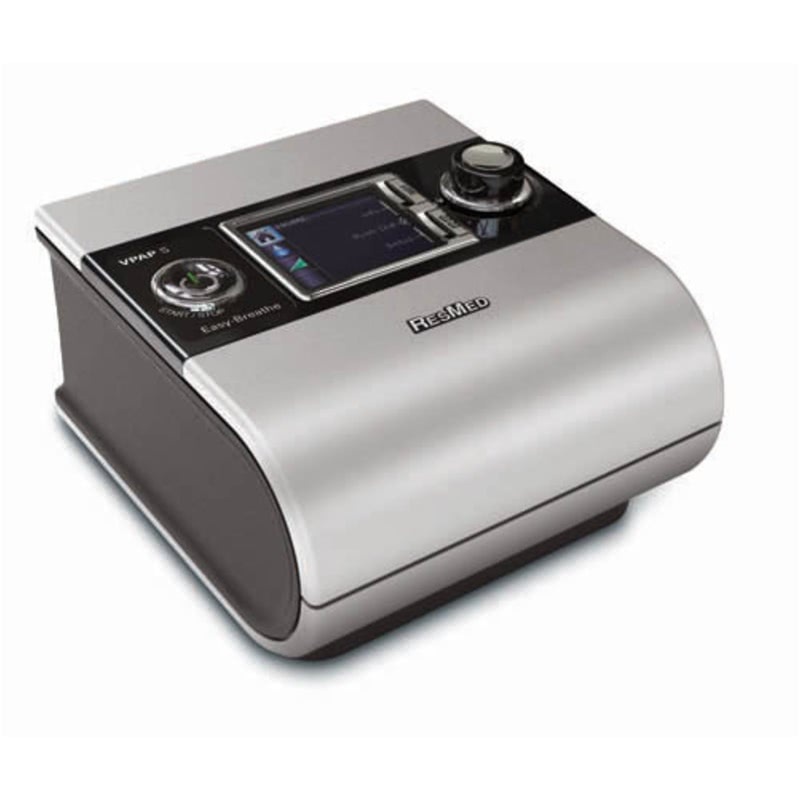 The H5i Heated Humidifier has three modes: Patient, Auto and OFF. These settings can be accessed under "Climate Control" through the Clinical Menu. When the H5i is set in Auto mode it will measure the amount of humidity in the room and heat only as much as needed to reach the optimal moisture level of 80% and then stop heating and go into a cool down mode. When the H5i again senses the need to raise the humidity to 80% it will begin to heat. When the H5i is set in Patient mode it will heat in the traditional manner until it reaches the desired setting of humidity or 80%. The H5i can be set from OFF to 6 and is adjusted from the HOME screen. The maximum level of humidification is 80% whether using the SlimLine of ClimiteLine Tubing. 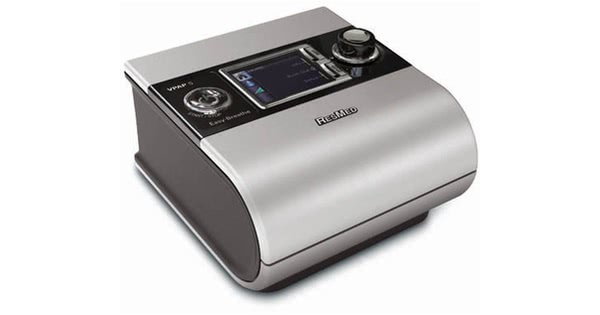 Tubing Options: ResMed's S9 VPAP S BiLevel Machine has a number of tubing options. The SlimLine 15mm tube is a non-heated tube in a thin, flexible style. The machine can also be used with an OPTIONAL heated ClimateLine Tubing which integrates with the machine and H5i Heated Humidifier to provide increased humidification and reduced chances of rainout. The ClimateLine is available in two diameters. The SlimLine 15mm ClimateLine Tubing and a standard diameter 19mm ClimateLine Max Tubing. Additionally a standard diameter, non-heated tube may be used. ClimateLine Tubing Lengths: A traditional CPAP tube is 72 inches long. The optional 15mm ClimateLine Tubing length is 78 inches. The optional 19mm ClimateLine MAX Tubing length is 75 inches. Installation of the ClimateLine: The ClimateLine attaches to the back of the machine using the same port as a standard hose. The electronics connection is below the port and may be covered with a protective flexible rubber cap attached the machine. Place the machine so the back of the unit housing the filter and hose connection is facing you. After removing the rubber cap, orient the hose so the electronic tab is facing toward the filter. Push the tubing end firmly onto the port, then rotate the tube clockwise to fit the two electronic connections together. Removing the ClimateLine: To remove the ClimateLine from the back of the machine, rotate the hose counter clockwise. The electronic connections disengage allowing the hose to removed. Cover the machine's electronic port with the flexible rubber cap to protect the connections. A traditional CPAP tube is 72 inches long. The optional ClimateLine Tubing length is 78 inches. The optional ClimateLine MAX tubing length is 75 inches. 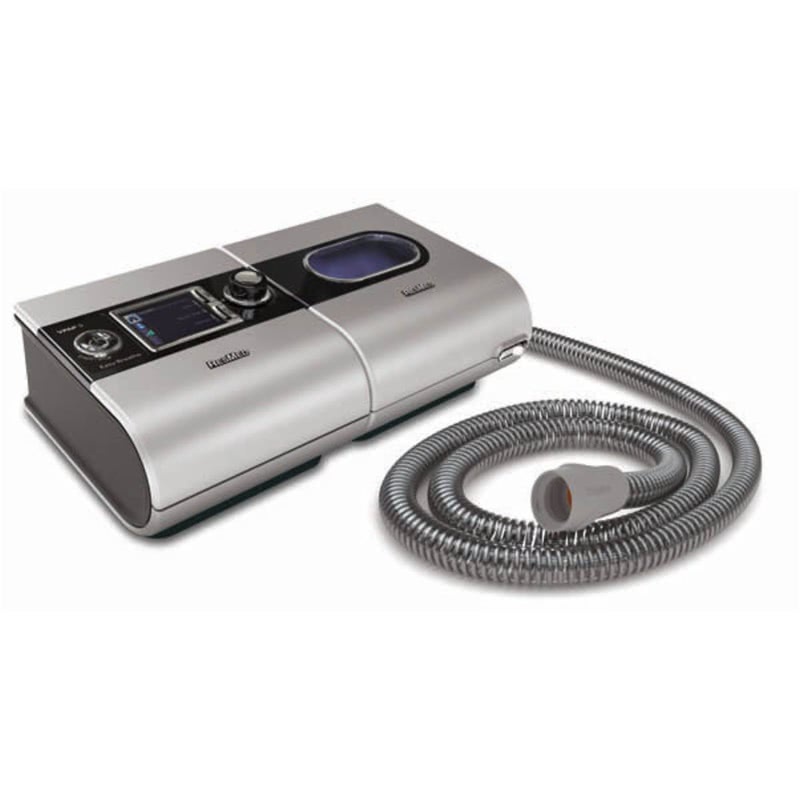 Per the manufacturer, the SmartStart auto on / off feature of this machine may not function as intended when used with a nasal pillow mask and a pressure setting of 7 cm H2O or less. If this feature does not appear to be functioning with this type of mask and pressure setting, this comfort feature can be turned off. Please refer to the User Guide for more information. The following information is applicable for the ResMed S9 VPAP S alone or with a heated humidifier. Keep in mind that using a heated humidifier will reduce the run time of the battery by approximately one half. DC capable: Use the DC Converter 24V 90W For S9™ Machines to operate the S9 VPAP S from a DC power source (battery). ResMed Power Station II Battery Kit for S9™ Machines: This battery kit made my ResMed provides great compatibility by using the S9's power supply for charging. S9™ Series DC Cable for ResMed Power Station (RPS) II: Already own a ResMed RPS II but are missing the S9 connection? This cord is made specifically for S9 units to connect to the RPS II battery. C-100 Travel Battery Pack for S9 Machines: This combination of C-100 Battery and S9 converter provide a great battery option for any S9 Machine. Respironics Battery Kit for S9 Machines: This kit includes a sealed lead acid battery manufactured by Respironics and DC power cord for use with S9 machines. This battery offers a longer runtime than a lithium ion battery. Inverter Requirement: Already have an inverter you want to use? A Modified Sine Wave Inverter rated at a minimum of 150W with an output of sine wave, square wave, triangle wave or sawtooth wave may be used. A higher wattage may be used if desired. CPAP.com offers the 150 Watt DC to AC Power Inverter. Please note that direct DC connection will result in approximately twice as much run time compared to use with an inverter. Failure to use the ResMed DC Converter 24V/90W For S9 Machines can result in damage to your CPAP. DC Converter 24V/90W For S9 Machines may be used with the Respironics Battery Pack (No DC Cable). The ResMed Power Station II is a battery kit made specifically for S9 machines. This battery kit includes all necessary components to connect to a S9 machine. It can be used with all S9 Series machines, and the battery is charged with the S9 power supply and cord. The battery can be used during travel or at home as a battery back up if electricity is lost. The battery has an estimated run time of 13 hours with an S9 machine set at 10 cmwp without a heated humidifier. Please note the addition of a heated humidifier will greatly reduce the run time of the battery. Please reference the ResMed Battery/Device List for more information on Battery Run Time. This external lead acid battery pack is the ultimate in power, portability and convenience. This battery pack is a great option to have on hand to power the S9 VPAP™ S CPAP Machine in the event of a power outage. This battery kit comes with the Respironics Battery Pack and the DC Converter 24V 90W For S9™ Machines.